With the king near death, and Fitz's only ally off on a seemingly hopeless quest, the throne itself is threatened. Meanwhile, the treacherous Red Ship Raiders have renewed their attacks on the Six Duchies, slaughtering the inhabitants of entire seaside towns. In this time of great peril, it soon becomes clear that the fate of the kingdom may rest in Fitz's hands-and his role in its salvation may require the ultimate sacrifice. Ive told numerous friends about the Farseer line so they can enjoy it as much as I have. Your heart can't help but go out to these characters Robin Hobb has written into life. A true artist. I couldn't put it down. Excellent transition into this novel from the first. Also this narrator knows how to deliver. Narrator is really good. Kids and I are enjoying the series on our road trips! The Narration of this series is really well done. The book series itself is definitely worth reading/listening to if you are a fan of fantasy. I am loving this series of books. Thank you for introducing me to the rich imagination of this author. The narration is also exquisite. I have been enjoying hours of entertainment and intrigue. Have to agree with other reviews. Awesome. Feelings are brought to the front. Fitzchivery "skilling". Is like I am inside of him feeling and seeing what he does. So life like so real so compelling, luring and just down right good. Not sure I would read all of her books but will definitely keep up with the farseer line. The characters she writes are amazing, the ability she has to write flawed characters and evoke such emotions is one of the reason I continue to read/re-read/listen to these books! 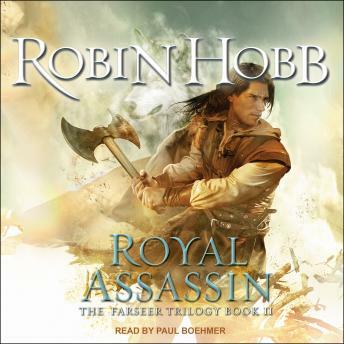 Robin Hobb has a talent to get you to fall in love with her characters. I am now spoiled by her abilities to weave strong characters with intrigue.